On Monday, October 8, 2012, as I sat in my office at Seattle Pacific University, I received a phone call from a colleague that I will never forget. The call was in regard to one of my students, David Murahashi, and it prompted immediate fear, concern, and prayer for him and his family. I first got to know David when he became a special education major as a sophomore in 2009 and took many courses with me. He was completing his senior teaching internship with only two quarters remaining to become a certified special education teacher when he collapsed at Ballard High School with an arteriovenous malformation brain bleed. By the grace of God, a school nurse was on call, and she immediately called an ambulance. At the hospital, he was rushed into surgery. 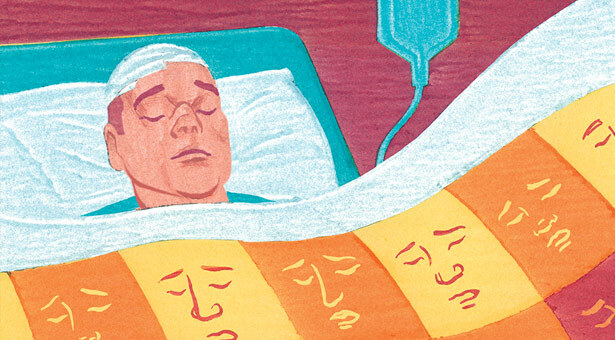 The doctors were able to stop the bleed, but David was in a coma, and the areas of his brain that controlled speech and motor planning had been affected — to what degree no one knew. He remained in a coma for a week with a breathing tube. It was not clear whether he would awake from the coma, and if he did, his family knew that he faced months of physical, speech, and occupational therapy. Because SPU’s special education majors know each other well, when David’s classmates heard about his illness, they began to pray for him. They contacted their friends, prayer chains at their churches, and asked pastors to pray for David publicly. The SPU School of Education staff and faculty were also in constant prayer for David and his family. During this time, I prayed about how we could support the family, and asked them what we could do. The Murahashis had volunteers from their church providing meals. What my students and I were able to provide was companionship for David’s older sister, Holly, who has Down syndrome. Students and School of Education staff members provided transportation, conversation and entertainment for Holly. In the process, they got to know a young lady with a fabulous sense of humor and beautiful smile, and one of the most loving and loyal sisters I have ever met. Throughout the ordeal, we had a chance to experience, through prayer and mutual support, and by witnessing the Murahashi family’s strong Christian faith in the face of a terrible crisis, the power of God’s love in our world. We saw how God loves each of us as his dear children, and how our desire as God’s people should be to extend this love and care to others. 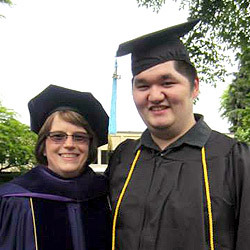 Debby Hudson, SPU assistant professor of special education, and David Murahashi ’13 at graduation. Nearly a year and a half later, David’s recovery, though slow, is miraculous, according to his doctors. David’s faith, self-determination, and self-discipline have helped him as he had to start from the very beginning, learning to walk, talk, and read all over again. He has experienced significant loss for a 22-year-old, such as losing the peripheral vision needed to be able to drive. No doubt he will grieve these losses, but he has already begun to move forward by gaining part-time employment at the Washington Initiative for Support Employment, where he worked before the brain injury. As I have walked this journey alongside David and his family, I have witnessed the strength and power of a close, faithful Christian family. I have also experienced the intensity and depth of community within this Christian university setting, and it has empowered me to continue my mission to educate and share God’s vision of an inclusive, loving world. Sometimes people who are not teachers ask me what the duties of a teacher are. Is it a teacher’s duty to go to a soccer game or attend a piano recital? To attend a baptism? Or to follow through after a devastating event such as David’s brain bleed and to witness his miraculous recovery? Well, no, it is not in my contract. And no, frankly, it has nothing to do with being a teacher or a professor. I believe we all have the power to demonstrate the love of God and power of acceptance in community through understanding, recognition, and education.These acts are not about a job or a duty or an obligation, but a way we can bear witness to the love of Jesus Christ. I invite all of you to witness the amazing strength of God’s love by extending that love to people in your lives. Debby Hudson is assistant professor and chair of special education at Seattle Pacific University.